Most families don’t own a family Bible these days, but once you found them almost everywhere, and where they do still exist they can be a superb resource for genealogy. The generations are listed, as the Bible is passed down through the family, so it can become a great help in filling out – and starting a family tree. Family Bibles tend to be more common in America than in Britain, in large part because it’s a younger country where things are more likely to be handed down rather have been lost, and much the same applies in Australia and New Zealand. But that doesn’t mean they aren’t around in the UK. They can be with older relatives, hidden away in the attic, or just forgotten in some dusty place. They were a commonplace during the Victorian era, and they can’t have all vanished! To discover if your family has a family Bible, just start asking. Try your parents first, to see if they remember anything, then all your older relatives. If it exists, they’ll be able to set you on the right track. It might seem like a lot of effort for a book, but remember, this is a book with history. 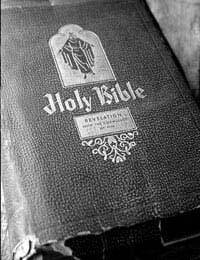 Most family Bibles are well over a hundred years old, and if you hold one in your hand, you’re holding not just a book, but part of your family’s heritage and a great tool for the family tree. That makes it worth the effort to find. If relatives remember one in the family, then trying to find it can prove to be an interesting task, and one that can teach you a lot about your own family as you talk to people. You’ll almost certainly hear some family stories, whether there’s a Bible or not, and possibly meet relatives you didn’t know or have rarely seen. It will certainly introduce you to the family side of family history, and that’s always useful. The family Bible makes for an ideal resource for genealogists exploring the family history. In some cases it’s good for filling in gaps, but it can also make an excellent starting point, going back through several generations of family members. Often it will include dates of birth of children, giving a head start on genealogy research. To be fair, the information can be quite bare bones. But in many cases it will be information you wouldn’t have otherwise, which makes it invaluable. The might have been a child who only survived for a few days or months, and it will probably be listed, a family member you might never have discovered otherwise. From the information in a Bible you can make a great start on a family tree, and it should be feasible to make out the relationships from generation to generation which is so vital in genealogy. Of course, you still have to do other research (unless you have no choice, don’t take a single source as always being truthful, even a family Bible), and find birth certificates, death and marriage certificates and entries in parish registers. But as a start of addition, it’s perfect genealogy material.